We are right and left brained at Celebelle so you don't have to be. Content creation, websites, bookkeeping, branding packages, social media support, administrative know-how -- Celebelle offers both creative and administrative services - everything you need to keep your business growing. ​Most successful small businesses will eventually reach a business plateau. A place where further growth is difficult without investing in operational change and refreshed marketing materials. For solopreneurs, figuring out which tasks can and should be outsourced for maximum efficiency and profit can be a game changer, while a small business team or nonprofit can benefit from identifying and eliminating areas of disorganization and waste. Through our Small Business Consulting division, Celebelle is pleased to provide a fresh and experienced set of eyes to help guide you to your next level of success. Celeste Shepherd, founder of Celebelle, leads the division and brings a unique skill set to the table that includes both administrative + marketing expertise. Celeste is a problem solver who has worked in the trenches of small business and excels at finding efficiencies and untangling business problem areas. Further growth awaits - contact Celebelle today to schedule your consultation. Adie Mackenzie is a private practice Licensed Massage Therapist based in Nashville. Certified in the treatment of Lymphedema, Adie specializes in Lymphatic Massage & Lymphedema Management (CDT) as well as bodywork to address chronic pain and voice dysfunction. Adie’s passion for her work fuels her advocacy for causes such as the Lymphedema Treatment Act, which advocates for improved insurance coverage for the diagnosis and treatment of the disease. Adie chose our Small Business Start-up Branding Package as her starting point and worked closely with us to create a customized collateral package that fit her particular needs. At Celebelle, the branding journey begins with our creative team learning everything we can about your business and your philosophies. The goal is to create designed collateral that exudes professionalism, commitment, and your own unique point-of-view. Colors, fonts and graphics should be a harmonious reflection of your core values and work to build the visual foundation upon which your brand will stand. Naturally, these brand elements will cascade to all the collateral you use to define and promote your business. 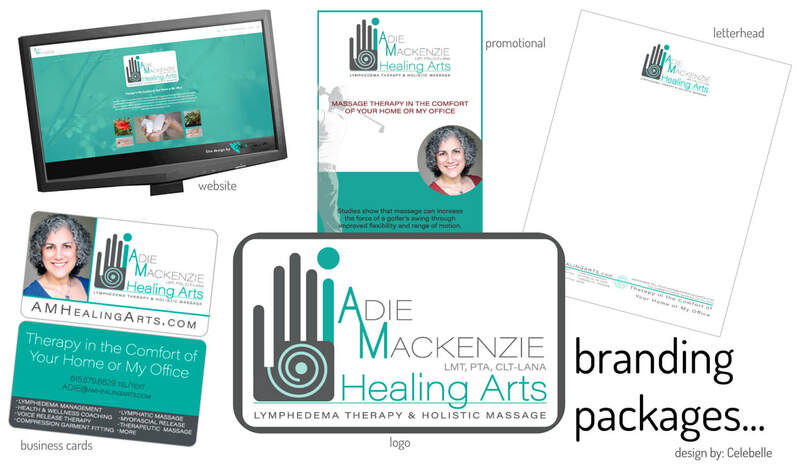 Once a brand foundation was in place, we designed a new logo that captured the essence of Adie Mackenzie Healing Arts simply, memorably and beautifully. Spring boarding off this initial creative piece, we created a sensual, soft to the touch, rounded corner business card as well as her first print advertisement incorporating the new logo. Existing collateral like resumes and letterhead were also redesigned to reflect the new brand and as a final step we applied the branded look to her social media accounts. From there, Adie added on Do-It-For-You Web Design. We chose a free Weebly template that offered the simplicity of function and the soothing feel Adie’s new brand required. After taking these preparatory steps, we were able to migrate applicable content from her old site to the new site. Adie easily transitioned into self-management of AMHealingArts.com with minimal training. Thank you Adie for choosing Celebelle to support you on your branding journey! If you need help defining your brand and getting your website off the ground, drop us a line - we'd love to hear from you! What else have we bragged about?